HABIT: Native of the Chihuahuan Desert. Typically found growing on rocky slopes or ridges that are comprised of limestone gravel. Single-trunked normally but mature plants may branch and become multi-headed. Flowers are white and form flower stalks that rise above the plant. CULTURE: Tolerant of the heat but also to rainfall and supplemental irrigation but very drought tolerant. USES: Attractive and effective accent plant, can be planted either as an individual specimen or in a mass planting. Desert-type gardens, specimen, accent. NOTES: Yucca rigida or Blue Yucca makes a good alternative. The two plants are often mistaken for one another but Blue Yucca has thicker but fewer leaves which are more rigid and bluer. 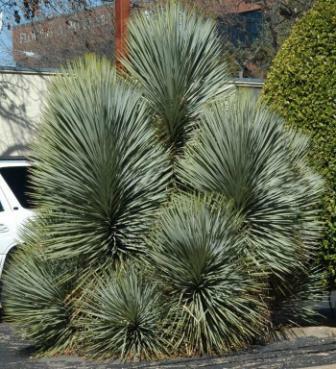 Y. rupicola is the twistleaf yucca has twisted leaves on older foliage.